We are proud to announce our resident DJ BORG will be part of the exclusive Praga Kahn / Lords Of Acid double concert night. DJ BORG will provide the pounding Electro & Wave tunes on this special nigh! Line-up complete! New location Zappa (Antwerp) confirmed! We must admit, we ourselves almost began to worry but today we are very happy to announce the Black Easter line-up is complete! When Black Easter inspirer (and fellow Peek-a-Boo founder) Ward De Prins unexpectedly passed away on 14 February last year, some of his best friends decided to still make his dream come true. After all, Ward had already started to plan a new edition of Black Easter for 2019! Based on a wish list and a selection of artists who performed on one of the previous editions, we think we have succeeded in putting together a rather impressive and diverse line-up. 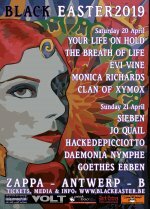 From the early start on Saturday 20 April they kick-off strongly with Post-Goth-Rockers YOUR LIFE ON HOLD (B). Up-and-coming Belgian talent who surprised friend and foe with their debut album 'Burning for the Ancient Connection''. Then THE BREATH OF LIFE, who already played Black Easter before in 2015, will enchant you with a firm dose of Gothic-Rock drenched in the angel-sweet voice of frontwoman Isabelle Dekeyser. Also EVI VINE (UK) and her following stand ready to take you on their Folk-Tronica trip. A journey interspersed with dreamy sounds and dark atmospheres with which she mesmerized the Black Easter 2016 audience once before. As a co-headline, none other than artistic centipede and Gothic icon MONICA RICHARDS (US) (Faith & The Muse), together with her partner in crime Anthony Jones (US) (Monastic), will take the Zappa stage. Did you know, the Black Easter's poster background of this edition is based on a painting by Monica Richards herself?! Finally, to finish off this great first night with a true feast, CLAN OF XYMOX (NL / D) has also been added as a headliner! Chief Ronny Moorings and his band members will present you with a mix of new work and, of course, a lot of their classics! On Sunday 21 April there seems to be no time for a warm-up as this Easter Sunday will immediately begin at a high level with SIEBEN (UK)! The solo project of violin virtuoso and eccentric Matt Howden. Matt Howden worked in the past with almost innumerable artists like Sol Invictus (UK), Tony Wakeford (UK), L'Orchestra Noir (UK), L'Ame Immortelle (AT), Emilie Autumn (USA), Faith & The Muse (USA), The Wand And The Moon (DK ), Larsen (IT), Spiritual Front (IT), Shock Headed Peters (UK), Hekate (DE), Job Karma (PL)... Whilst only armed with one microphone, one violin and a loop pedal, he still manages to create the impression that there is a whole band on stage! Something JO QAIL (UK), who uses approximately the same arsenal, is very good at too. But instead of a violin, she chose to bring her cello along as her favourite instrument. This pleasant and entertaining appearance also succeeds in mesmerizing her audience with her musical creations. No music genre is out of her league as you will hear! One of the big surprises of this Black Easter edition is the appearance of no-one less than ALEXANDER HACKE (EINSTÜRZENDE NEUBAUTEN) and his life companion DANIELLE DE PICCIOTTO (SPACE COWBOYS). Together they travel the world and the seven seas performing and composing beautiful music under the moniker HACKEDEPICCIOTTO. Their compositions are mostly built around cinematic drone sounds with avant-garde influences and elements from world music, Krautrock and so much more. And of course, there is no better way to end this Black Easter weekend than seeing the German über Goth band GOETHES ERBEN perform! OSWALD HENKE and his entourage were already present at the very first edition back in 2015 and always deliver a great concert! As we are used to from them Henke will not only play some new stuff but will also spoil his fans with a bunch of Goethes Erben classics! And oh yeah, due to reasons beyond our control and last-minute, we were forced into finding an alternative venue ... It was a hard and long struggle but finally, and completely by surprise, we landed safely back at the wonderful Antwerp venue, Zappa. As loyal Black Easters goers will know this is the venue where the Black Easter story began! Line-up International EBM Day (-1) complete! After the succes of our very first International EBM day edition earlier this year we decide to do it again in 2019. Although our first edition was very international, we chose this time to have a 100% Swedish line-up by inviting some the best EBM/Electro acts Sweden has to offer these days. WULFBAND is from the Swedish capital Stockholm founded in 2014 by a masked duo who sings / shouts in German and officially call them self Sieben & Neun. For reasons that our not affairs, the band prefers to work with an anonymous creative image instead of putting their personal identities first. As far as music is concerned, it can be argued that it is inspired by the early post-punk DAF, and when you feel the urge to comment on their German pronunciation, know well that these gentlemen are quite capable of inflicting serious damage ... Whether or not auditive ... Wulfband describe their music as "Gewalt-Tanz und Angriffe gegen Alles"
ALVAR does not needs an introduction to the regular BodyBeats ranters, as they performed already twice for us in 2017. The first time they played the Dark Demons night (Antwerp) where they overwhelmed friend and foe claiming their well deserved opening spot at BIMFES 2017. Also on BIMFEST they caught the attention with ease. According to some, their music is situated between dark, sometimes lingering dark electronics and sometimes pounding EBM. Connoisseurs even claim their music to be reminiscent of early releases of the cult label Cold Meat Industrial. NO SLEEP BY THE MACHINE stands for energetic and pumping live performances, so no wonder they they have also played BIMFEST before in 2013. Their music is rather an uncompromising complaint against injustice and figth more freedom in our society. Now, after several years of inactivity, the band is back now and is working hard on a new album. In the meantime you can still discover their slightly fantastic previous albums Close, Quadrilateral, Splice on their Bandcamp. SEVERE ILLUSION was founded in 2000 by Fredrik Djurfeldt and Ulf Lundblad and released five albums, an EP, and more since. It's clear this band is also popular outside their home country, as proves by the the impressive list of the band's outbound performances over the years ... Germany, Russia, Chile, Hungary, Ukraine, Slovenia, Poland, Czech Republic, UK, Uruguay, Brazil, Canada and Denmark ... and now for the second time in Belgium! Their mix of dark harsh electro with EBM influences draws many to the dance floor. Of course, this EBM feats would not be complete without an pounding after party by resident DJ BORG. 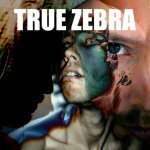 Belgian and electronic einzelgänger True Zebra is releasing a compilation album featuring a selection of songs from his first three DIY underground releases. A “best of”, “greatest hits”, “most played live”… however you want to name it is now available for the masses! All tracks were written and recorded by mastermind Kevin Strauwen between 2008-2016 and all got a remastering treatment for this release. BOOK this great live act on your event now! The band who always wrap themselves in dense wafts of mist and cool lighting on stage have played numerous festivals, such as the Mailfeld Derby, Wave-Gotik-Treffen and New Waves Day and accompanied British act OMD on their 2017 European tour. At the end of the year, HOLYGRAM are set to embark on an extensive support tour with VNV Nation through Europe and the US to introduce their debut album Modern Cults live. The recording takes up where their self-titled 2016 EP left off and intensifies HOLYGRAM‘s contemplation of themes such as big cities, alienation and anonymity, hope and memories, love and identity: These constant reflections always interact closely with the band’s unmistakable sonic guise. The atmosphere oscillates between the brutal sounds of the big city and the fragility of the people that lose themselves in it – intelligently observed scenarios of a world falling apart in which individuals have long ceased to play a leading role. The eleven songs were created over the past few years and some of them have already been tested in a live context. Numbers such as the title track Modern Cults or the spherical Still There follow their protagonist on a nocturnal trip through clubs, flashbacks, run-down neighbourhoods and the abysses of the human psyche. The diversity of the cityscape as a reflection of the people who live in it seems like an Ariadne‘s thread that the five musicians offer to their listeners to help them navigate this broad stylistic range. Because HOLYGRAM don’t see themselves as representatives of a specific genre. Melancholy walls of guitar sounds (Distant Light) interchange with uplifting bass runs (Hideaway), chilly synthesizers meet stoically driving rhythms and together make up the projection screen for the ambivalent stories that HOLYGRAM tell in their music. While 1997 wanders through forgotten places in a broken-up relationship, the song She’s like the sun is an ironic confrontation with the failure to achieve unreachable targets. Autobiographical elements blend with fiction, the past melts into the present and they all become a simultaneously oppressive yet hopeful vision of human (co-) existence: a person caught in the mist of their own dreams at the intersection of outer and inner world, between fiction and reality. This is also where the first single release Signals (scheduled for release on 7 September) comes in, featuring a new-wave guise that belies an emotionally torn lyric, elevating the deeply melancholy chorus (“Sometimes when I close my eyes I see you walk away / And everytime the sun comes up the feeling is the same”) to a pop-like anthem, illustrating that in this world people are only cogs in a much bigger, increasingly autonomous machine. For the production of their album, which was recorded at Cologne’s Amen Studios, Patrick Blümel (vocals), Sebastian Heer (drums), Marius Lansing (guitars), Pilo Lenger (synthesizers) and Bennett Reimann (bass) enlisted the support of Maurizio Baggio, who also produced The Soft Moon’s albums Deeper and Criminal. Together they worked on the band’s established sound, enhancing it with a myriad of facets. HOLYGRAM will perform with VNV NATION at the Casino, St-Niklaas (B) on Sunday October 21st and tickets are going fast so click the link below to order those last available tickets now! Best reviews of top australian online casinos for Australian players, bonuses and special offers from online casinos. Read rewiews of best online slots for players from Canada and play! Looking for best online pokies real money nz to play? Visit our site. 29/01/2019 Line-up complete! New location Zappa (Antwerp) confirmed! 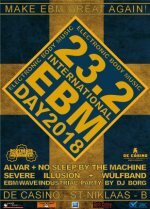 03/12/2018 Line-up International EBM Day (-1) complete! 06/09/2018 The Force Dimension releases brand new album Sorcery Pigs! 06/07/2018 New Peek-a-Boo Magazine #30 - Out Now! With free download! 23/05/2018 LEÆTHER STRIP (DK) 30th anniversary show confirmed @ BIMFEST 2018!! !